On January 9, 2014, the San Diego County Water Authority’s Imported Water Committee held another workshop in a continuing series of workshops that are focusing on the Bay Delta Conservation Plan as the Authority prepares to submit formal comments on the BDCP before the April 15 deadline. This post covers the the first half of the meeting with Water Authority Engineering Director Bill Rose and Engineering Manager Gary Bousquet giving a preliminary analysis of the BDCP’s proposed infrastructure. Covered tomorrow, the second half of the meeting with Director of Water Resources Ken Weinberg and Principal Water Resource Specialist Dana Friehauf giving an assessment of the supply and demand risks of the BDCP. Engineering Director Bill Rose began by saying that the infrastructure design for the project is about 5 to 10% complete, which is rather minimal, so from an engineering standpoint, their review will be very high-level. The purpose of his presentation today is to talk about the staff’s review process and their initial concerns in preparation for the comment letter that the Board will be preparing in March. 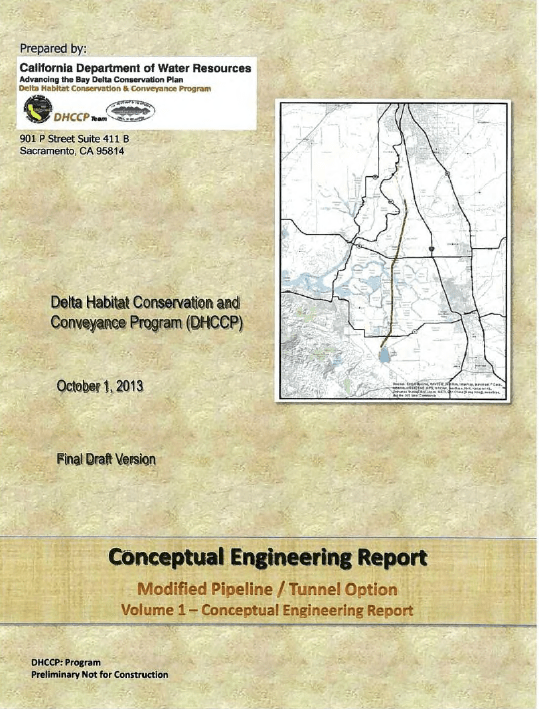 As part of the EIR/EIS, the Department of Water Resources released a conceptual engineering report that covers a variety of topics, including the operations, hydraulics, intake structures, pipelines, tunnels, siphons, forebays, utility and infrastructure crossings; but it is just 360 pages long for a project that is billions of dollars which represents that 5 to 10% design, he said. The preferred alternative is the only alternative that was considered in the conceptual engineering report. They also are evaluating the geotechnical report, which is an additional 80 to 90 pages. 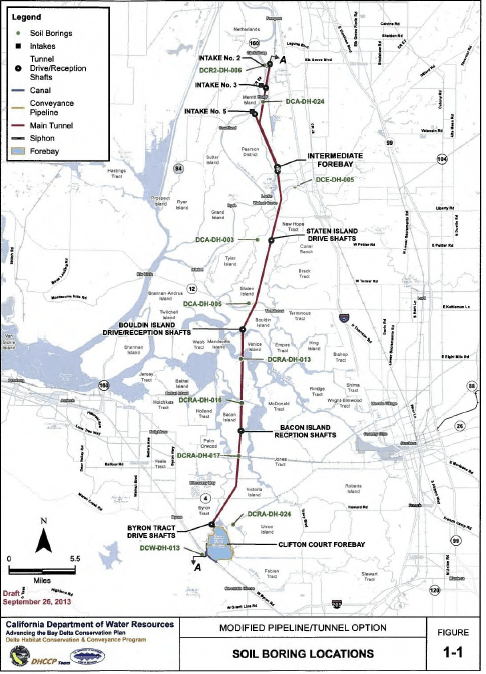 He then presented a slide of the tunnel alignment, noting that at the top edge of the graphic is the City of Sacramento, and Stockton is to the right. He pointed out that as the Sacramento River comes south from Sacramento, there are three intake structures, each with the capacity of 3000 cfs. 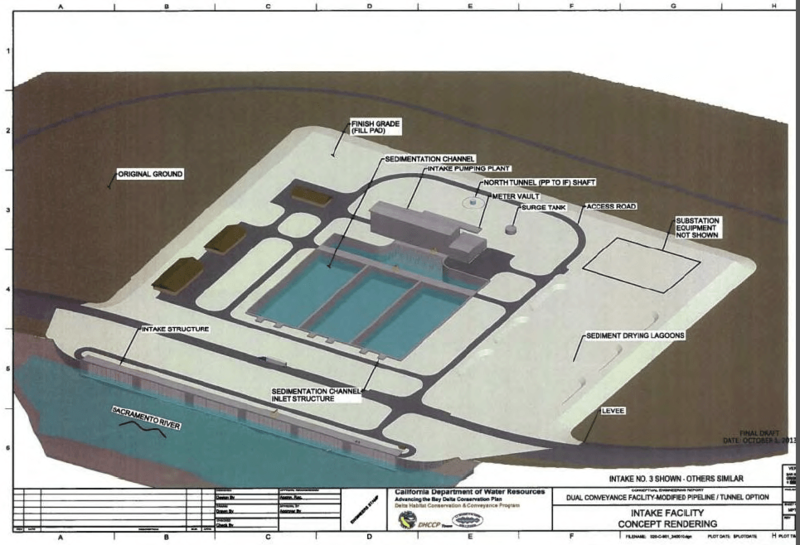 The intakes are connected by tunnels that are from 20 to 29 feet in diameter which are connected to a 40-acre intermediate forebay. 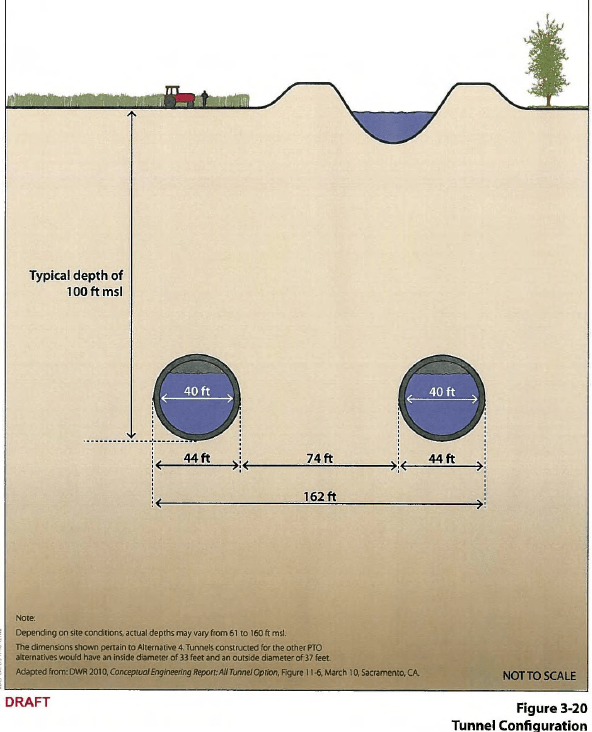 That forebay is in turn connected to the two 40-foot diameter tunnels about 30 miles in length that will connect to the existing Clifton Court Forebay down near the south end of the Delta. He noted that there were significant modifications planned for Clifton Court Forebay. 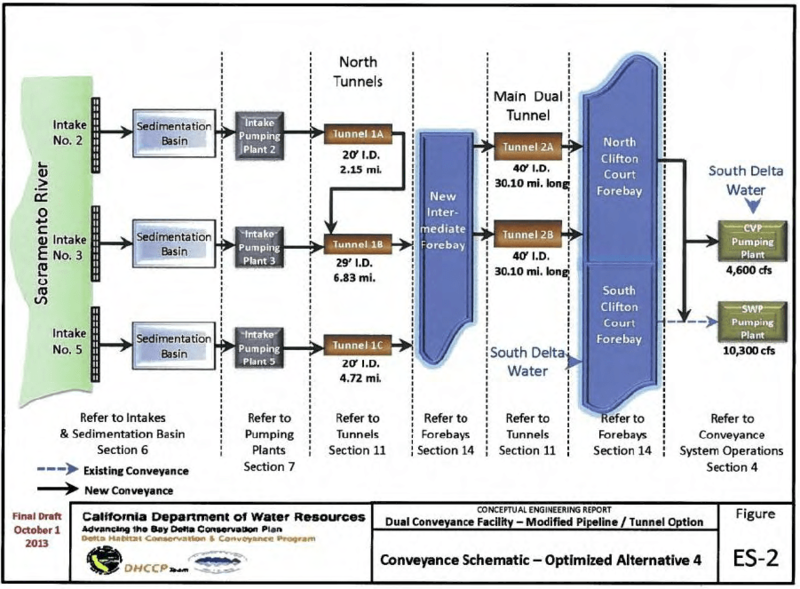 He then presented another slide which was a schematic of the conveyance system which shows how the water moves from the Sacramento River through the intake structures, sedimentation basins and pumping facilities through 20 and 29 foot diameter tunnels to the intermediate forebay, and then the two 40-foot tunnels to Clifton Court Forebay and ultimately to the pumping facilities for the Central Valley Project and the State Water Project. Mr. Rose noted that staff is just looking at the preferred alternative, the 9000 cfs, that is the subject of the conceptual engineering report. 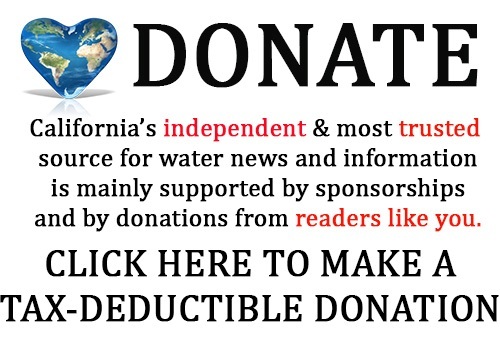 There are obviously other options: the No Action Alternative, the NRDC portfolio approach, and the Bay Delta Vision Foundation’s BDCP Plus concept. However, there is little information about those simply because they have not been studied in as great of depth, he said. 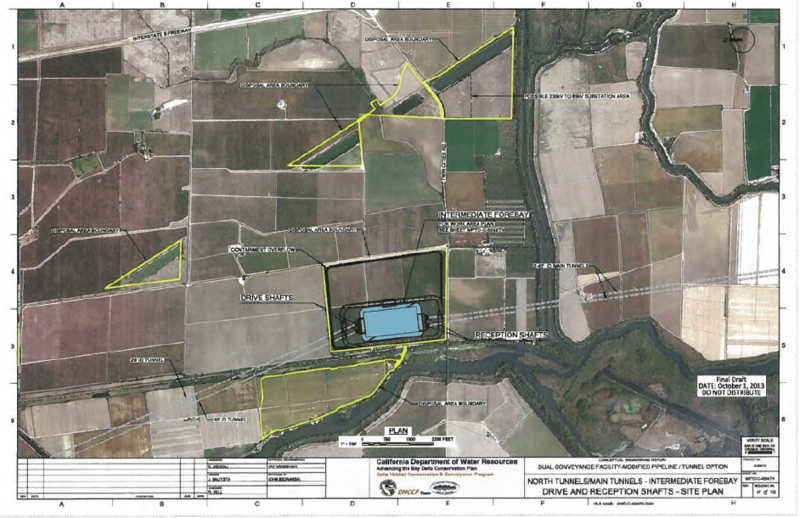 He then presented a slide of the intermediate forebay, noting that the areas highlighted in yellow are where they will dispose of tunnel muck and dredging material. “Out of this project, there will be 32 million cubic yards of tunnel muck and 8 million cubic yards of dredging material that will have to be disposed of as part of the project,” he noted. Along the 30 mile tunnel route, there will be five tunnel launch and retrieval shafts that will have to be excavated from the existing ground surface down to the bottom of the tunnel, said Mr. Rose. 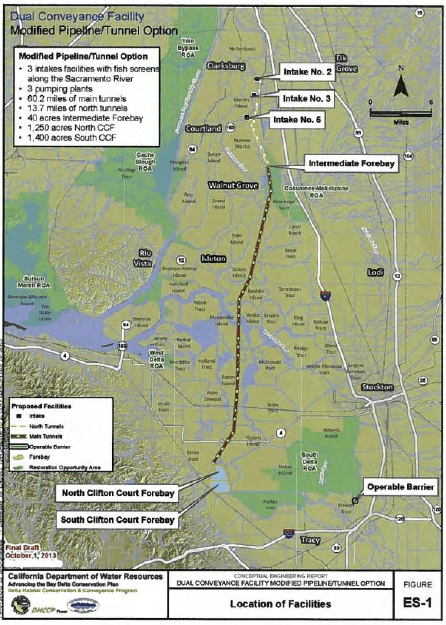 The Clifton Court Forebay will be split into two, north and south which will require considerable relocation of roads and utilities, and there will also be the need for not only temporary power to run tunnel boring machines and other facilities, but also permanent power to run the entire facility, he said. If the project were to gain approval of the EIR/EIS and get the go ahead, it’s about a 15-year process to complete the design and complete the construction, he added. He then presented a depiction of the cross-section of the twin 40-foot diameter tunnels, noting that while average depth is about 100 feet, but the depth varies from 65 to 160 feet deep. He noted also that the tunnel boring machines themselves will be 44 feet in diameter as extra room is needed for installation of the concrete segments and the liner. Engineering Manager Gary Bousquet then reviewed the cost estimates. 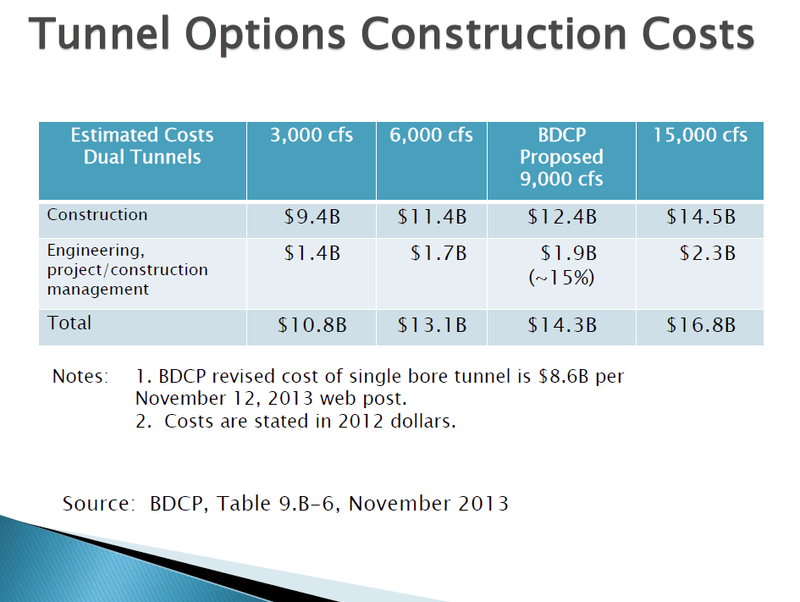 He began by presenting a slide which summarized the information provided in the BDCP report regarding the different sizes of tunnels that were considered in the EIR/EIS. The cost for the preferred alternative is a little bit over $14 billion which includes the construction and as well as the soft costs, he said. He pointed out that in November, the cost of the NRDC’s single bore 3,000 cfs tunnel option was revised to $8.6 billion, but the 3,000 cfs noted in his table is a dual bore option. The cost estimates are broken down into the different elements of river intakes structures, forebays and flow structures, tunnels and pipelines, control and communications, utilities and power delivery, he said, noting that getting permanent and temporary power to the different sites is going to be one of the more challenging aspects of this project, and it is broken out separately. There is a contingency of 36%, Mr. Bousquet noted. Other cost estimate factors are the soft costs, which would include things such as project management, engineering and design costs, the plans in which to implement the project, and the power schemes, he said, noting that about 15% is set aside for those soft costs. Bill Rose said that they have been reviewing the conceptual engineering report since December, and he shared some of his initial observations of what some of the risks of the project would be, and things they will be investigating further. While the volume of tunnel muck that would be produced is significant, how it is removed and disposed of is a significant design component; the tunnel work will also require adequate ventilation design. 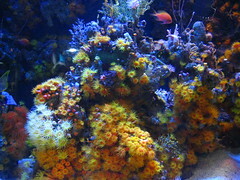 “Those are all power-intense uses, all of those, so we want to look at those,” he said. The state is limited to a design/bid/build type of project, but large, world-class projects like this one don’t necessarily lend themselves to that, he said. 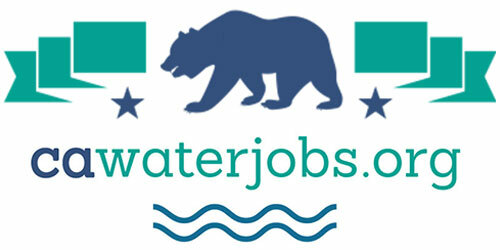 “It places a tremendous amount of risk on the state of California as far as to construct these, so we want to understand better the project delivery method and what might happen there as best we can.” He added that how project labor agreements or local labor that would be incorporated into the project are elements they would also need to consider. He pointed out that temporary power would be needed to operate all of those boring machines, and the report alludes to generating some of that during construction which would mean some type of generator which might have air quality impacts. There are five different power providers along the route, which poses some unique risks, he noted. Borrow material will be needed for the tunnel structures, and their conceptual engineering report indicates that they are not sure they have enough suitable borrow material, Mr. Rose said. There will likely be issues with natural gas wells, both active and abandoned, as well as issues with infiltrated water that will have to be dealt with. There are five intermediate shaft sites for the two 40-foot diameter tunnels, and those will have to be dewatered the entire length of construction, which is a significant effort, he noted. A number of roads and utilities will have to be relocated, and this is not always easy, he added. Another significant issue is that this project has a 15 year horizon so it calls into question the accuracy of cost estimates over that extended length of time. However, the most significant concern we have is with the lack of geotechnical information, Mr. ROse said. The state experienced legal difficulties with landowners that prevented the geotechnical work from being done. “They suspect that the Delta is underlain by alluvial materials coming off of the Sierra Nevada and the Coastal Ranges into the valley and they do have a number of borings that would give them some idea of what it looks like, but their borings are not necessarily in the location of the tunnel.” He noted that they have used historical data and field work to identify soil types and make generalizations, but certainly as part of any future design, more geotechnical information will be key. “Underground work is risky, any way you look at it,” he said. Staff will be studying and reviewing the project documents as well as contacting the engineering team, and will be back by mid-February with an assessment so the Board can consider in March the comment letter which will be submitted in April. “Wouldn’t many of these issues be encountered with a 3000 or 6000 or 9000 cfs tunnel?,” asked Director Gary Arant. 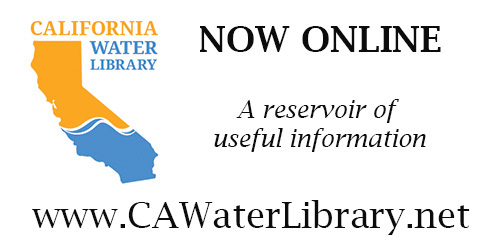 Click here for more information on San Diego County Water Authority board meetings.